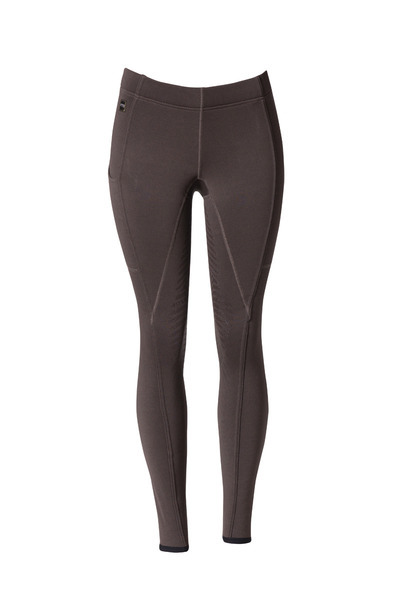 Full Seat Breech offering performance, comfort and now winter weight warmth! Much warmer than Power Stretch. Durable and easy care fabric that will keep you warm no matter what the winter brings on. Convenient, pull on styling. Warmth! New Polartec Wind ProTM fabric gives plush softness and warmth next to your skin. The outer surface is wind, water and grime resistant. 95% Polyester will wick moisture and manage chill while 5% Spandex and knit construction will give you ultimate stretch and comfort. Features FITS new technology inspired from athletic shoe tread design. This new Tech Tread pattern brings riding performance to a whole new level. Based on the study of rider movements in the saddle, the resulting pattern maximizes grip where you need it and minimizes it where you don't. Our new FITS ink is formulated to offer the best grip possible from printed fabric! - Also available in FITS All Season Lite fabric for comfort in warm weather riding, with 14% Lycra for anti-fatigue muscle compression. Easy care: Machine washable and line dry.